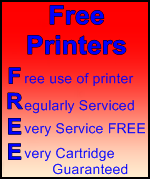 Many people buy a new printer and are then horrified to discover the cost of the cartridges the first time they need replacements. At Inkfil.com Chester we are here to help you to avoid that situation. We only stock printers that we know are economical to run and are always happy to have a chat about your requirements and advise on a printer that will suit your needs. In addition to stocking brand new printers we also provide a range of Warranty Backed Refurbished Mono and Colour Laser printers at a fraction of the cost of buying a new one. Whether you need one that is to be networked to a number of computers, can automatically print double-sided documents or will print, copy, scan & fax. OR WHY NOT POP-IN FOR A NO OBLIGATION CHAT ABOUT YOUR REQUIREMENTS!